First, I want to thank everyone who gave me ideas on honeymoon locations from the last post. It’s so hard to choose when there are so many great locations. It’s Friday, it’s time for a giveaway!! A few weeks ago I reviewed Julian Bakery’s delicious bread. I made the Banana Grilled Sandwich using their low carb bread. One of the best breakfast I had this fall season. 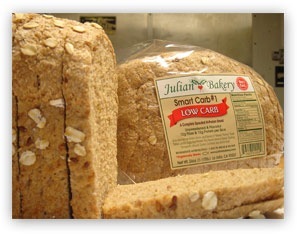 Julian Bakery makes low carb, gluten free and wheat free bread. They would love to giveaway their bread with one lucky reader. 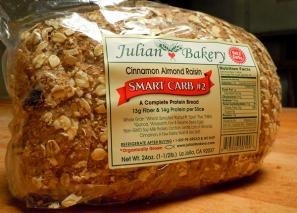 One winner will receive 2 loaves of bread, Smart Carb No.1 and Smart Carb No. 2 (Cinnamon Raisin). This bread was rated “Best Low Carb Bread of 2010” by Jimmy Moore’s Livin La Vida Low-Carb website. “We use whole grain in this unique low carb formula to make a complete protein LOW CARB BREAD. We bake our bread fresh and then ship it to your door. If you’re on a low carb diet or looking to maintain or lose weight then this bread is ideal for you as it only has 1 Net Carb per slice”. There is no other bread like it on the market. This low carb bread is simply perfect for taking in the proper amount of daily fiber and protein with 12g of protein per slice and 12g of fiber. The bread has a net 1 carb which allows you to be carb conscious on a low carb diet. This bread has sprouted organic grains increasing the fiber and moisture of the bread and making it easy to digest. Fresh Ground Whole Grain *Wheat, Sprouts of *Kamut, *Spelt, *Rye, Lentils, Sesame Seeds, *Millet, *Quinoa, *Amaranth, Ground Flaxseed, *Wheat Bran, Oat Bran, Eggs, Undenatured Whey Protein Isolate (90%), Chicory Root (Inulin Fiber), Wheat Gluten, Yeast & Sea Salt. Fresh Ground Whole Grain *Wheat, Sprouts of *Kamut, *Spelt, *Rye, Lentils, Sesame Seeds, *Millet, *Quinoa, *Amaranth, Ground Flaxseed, *Wheat Bran, Oat Bran, Eggs, Undenatured Whey Protein Isolate (90%), Chicory Root (Inulin Fiber), Wheat Gluten, Cinnamon, Raisins, Yeast & Sea Salt. 1.) “Like” Julian Bakery’s Facebook page, click here to go to their page and click on the “like” button on the top. Leave a comment on this post that you have done so. Make sure to leave your name and email address so I can contact you if you win. (This is mandatory to be entered in the giveaway). 2.) 1 additional entry = leave a separate comment and share what you are planning to eat with the bread or if there’s a recipe that you want to create using the low carb bread. Giveaway open to U.S. residents only and will end on Tuesday, 11/16/10. Winner will be chosen using random number generator and will be announced on Wednesday 11/17/10. Wow that bread looks awesome. I liked them on FB! Oh and I would definitely use it for a turkey avocado sandwich. Fave. Have a great weekend, girl! If I won, I would make that grilled banana sandwich, since it looked sooo good. BUt I would also slather on some butter to the cinnamon raisin bread since it sounds sooo delish! Well…with the 6 loaves I bought a few weeks ago i’m just toasting them in the oven and eating with my egg whites. I have dipped in egg whites and made french toast too! I’m pretty sure i’m already a liker but i’ll double check! Okay I desperately want this bread! I have a recipe for Pumpkin-Raisin Bread Pudding that uses raisin bread and this would be more than a little awesome! I eat some form of sandwich everyday, and this bread looks like it would make an absolutely lovely sandwich! I would probably use it for an almond butter/date syrup combo, or an almond butter/banana/honey combo…yum! I just liked the page on Facebook! I’d love to try their bread for avoocado toast (I simply top my toast with mashed avocado, salt and pepper, and a slice of cheese)! i “liked” them on facebook! 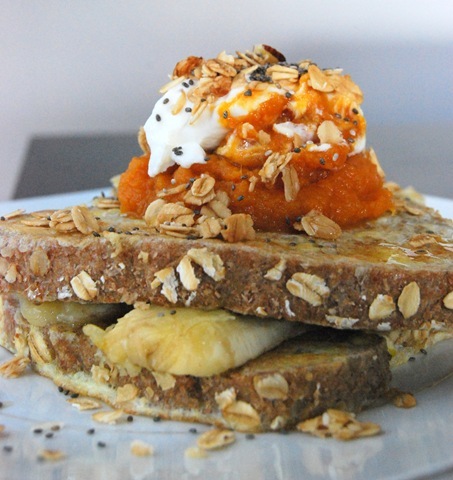 your banana grilled sandwich looks soooo good! i think the cinnamon raisin bread would made an amazing french toast! 🙂 i’d also like to try it out in a stuffing recipe for thanksgiving! Boring, but I SO wanna make French toast with that bread! Oh, and some peanut butter-pumpkin sandwiches!